The Northern Gateway Joint Review Panel has refused to consider the latest findings from the Department of Fisheries and Ocean on humpback whale critical habitat on the coast of British Columbia, including areas of ocean that could be on the route of tankers carrying diluted bitumen from Kitimat. On October 21, 2013, Fisheries and Oceans released a report called Recovery Strategy for the North Pacific Humpback Whale (Megaptera novaeangliae) in Canada. The DFO report notes that humpback whales are a species of “special concern” by the Committee on the Status of Endangered Wildlife in Canada. It is DFO policy to assist the humpback whale population to recover from the century of whaling that almost drove the species to extinction. The report identified four areas of “critical habitat” for humpbacks. One critical habitat zone is Gil Island at the mouth of Douglas Channel. Last week, on November 13, Smithers based environmental activist Josette Weir filed a notice of motion with the JRP requesting that the panel consider the DFO report as late evidence. Weir noted in her motion that there was insufficient information before the JRP that would identify critical humpback habitat. Three of the four critical known habitats are on the proposed tanker routes, and the Recovery Strategy acknowledges that other areas have not been identified. Without such information, it is impossible to assess the potential effects of the marine transport of bitumen on this endangered species.Activities likely to destroy or degrade critical habitat include vessel traffic, toxic spills, overfishing, seismic exploration, sonar and pile driving (i.e., activities that cause acoustic disturbance at levels that may affect foraging or communication, or result in the displacement of whales). The report clearly identifies vessel traffic and toxic spills, which are associated with the Project as potential causes for destruction or degradation of the Humpback Whales’ critical habitat. The Panel must consider this significant risk to an endangered listed species for which no meaningful protection measure can be offered against the risks associated with the Project. The JRP didn’t take long to reject Weir’s request, replying the next day, November 14. The Panel notes that the Recovery Strategy has been released in accordance with the provisions of the Species At Risk Act, as part of a legislative scheme that operates independently of this joint review process. communication, or result in the displacement of whales). A schedule of studies has been included to address uncertainties and provide further details on the critical habitat feature(s), as well as identify additional areas of critical habitat. It is anticipated that results from these studies will also assist in development of relevant protection measures for the critical habitat feature(s). In B.C. waters, Humpback Whales are the most common species of cetacean struck by vessels, as reported to the Marine Mammal Response Network. Between 2001 and 2008, there were 21 reports of vessel strikes involving Humpback Whales. Of these, 15 were witnessed collision events while the remaining 6 were of live individuals documented with fresh injuries consistent with recent blunt force trauma or propeller lacerations from a vessel strike. There are no confirmed reports of Humpback Whale collisions in B.C. waters attributed to shipping, cruise ship or ferry traffic. However, larger ships are far less likely to detect the physical impact of a collision than smaller vessels, and this could account for the lack of reported strikes. Collisions with large vessels may be more common than reported, especially in areas where larger vessel traffic is concentrated. Despite the fact that collisions may only affect a small proportion of the overall Humpback Whale population, vessel strikes may be a cause for concern for some local and seasonal areas of high ship traffic.. 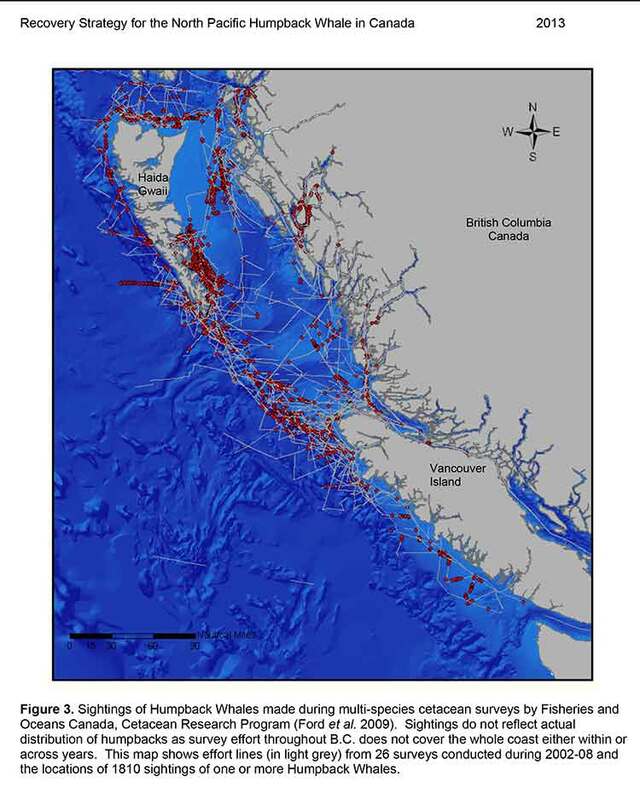 In B.C., areas of high probability of humpback-vessel interaction include Johnstone Strait off northeast Vancouver Island, Juan de Fuca Strait off southwest Vancouver Island, Dixon Entrance and the “Inside Passage” off the northern B.C. mainland which include portions of two of the identified critical habitat areas..
As the Panel has mentioned previously during the hearing, the later in the joint review process that new evidence is sought to be filed the greater the likelihood of the prejudice to parties. The Panel is of the view that permitting the Recovery Strategy to be filed at this late stage in the hearing process would be prejudicial to the joint review process. 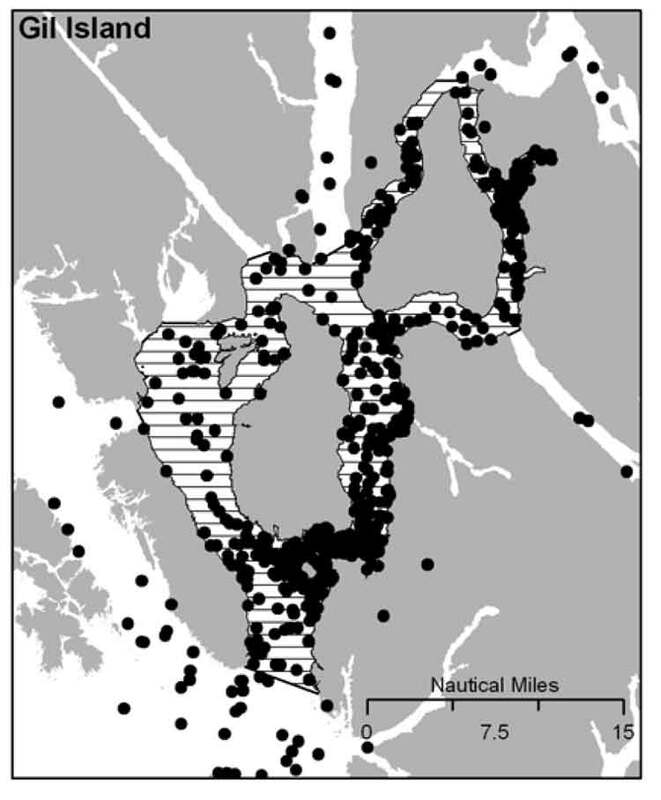 Weir’s submission to the JRP did not mention an academic study published on September 11, 2013, that also identified Gil Island as critical humpback habitat.